The first of law Thermodynamics is a version of the Law of Conservation Energy. This Law of conservation of energy states that the Energy neither be created nor be destroyed. It can only be transferred from one form to another form. And the Energy of the total isolated system is constant. 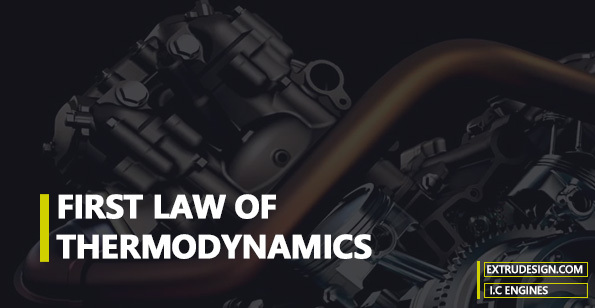 Let’s discuss the first law of the Thermodynamics more in detail. In a thermodynamic cycle, the Algebraic sum of the Work transfer is proportional to the Algebraic sum of the Heat Transfer. As we know the heat and work can be mutually convertible from one form into the other. So, the change in the internal Energy in the Closed system is equal to the algebraic difference between the amount of heat supplied to the system and the Amount of the Work done by the system. What is a closed system? or What is an Open system? or What is an isolated system? A closed system will not allow the transfer of the mass or the energy in or out of the system. Where an open system the transfer of mass and energy is possible. But in the Isolated system, the transfer of the matter is not possible but the transfer of the energy can be possible in the form of the heat. So back to the subject, This energy E will include many types of energy like kinetic energy, potential energy, electrical energy, surface energy, etc… But in thermodynamics, all these energies will not be considered and the energy due to the increase in temperature will be considered. So that we can rewrite the above formula as follows. Have you ever seen this expression dU = δQ + δW But how come “+” sign? Here we go… That is because how you consider the W. Some people used to say W is the work done by the system and some used to say W is the work done on the system. Does it really matter work done by the system or work done on the system? Yes, it does matter. Let’s understand with an example. The work done by the system is 10 Jouls. So the system spends the energy. so the resulting internal energy supposed to decrease. If the work is done on the system by 10 Jouls. Then the internal energy will be increased. Now it makes sense? If still not, leave your comments in the below comments section, I will help you understand it. We have discussed the two statements of the first law of the thermodynamics. This law is theoretical. In actual practice, we cannot build such a closed system that obeys this law. It is not possible to build a machine that can run without energy loss or continuous motion without an energy source. It is an equivalent statement to the Perpetual motion Machine. A Perpetual Motion Machine is a hypothetical machine which runs indefinitely without the energy source.